The microKORG XL just got bigger! In the next evolutionary step, the microKorg XL+ delivers a fresh update to the sounds and design of the microKorg XL. Its fat, powerful sounds, unmistakably unique exterior and keyboard staples make the microKORG XL+ the ideal compact keyboard. 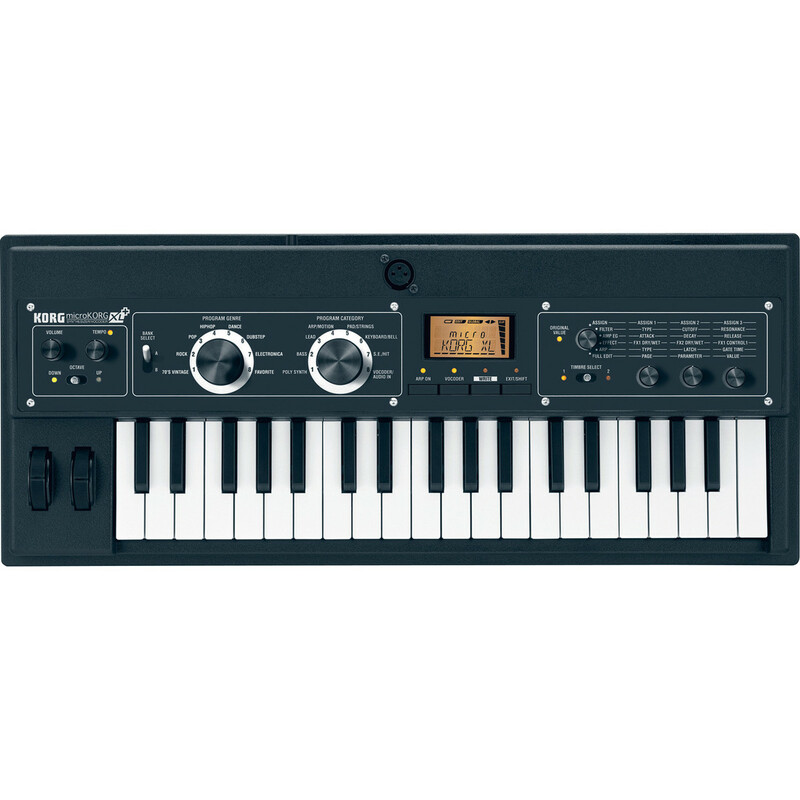 The lush analog modeled synth sounds that were characteristic of the microKORG can still be found on the microKORG XL+ but in addition the microKORG XL+ comes equipped with the piano sound from Korg's classic stage piano as well as the hard-edged grand electric piano making this keyboard perfect for band use. You'll also find sounds from the M1 and VOX organ, vintage tape-type string and flute machines as well as other selected sounds from keyboard history. All together the microKORG XL+ boasts 128 sounds, all of which are genuinely usable, meaning the microKORG XL+ will serve well as your main or secondary keyboard. The microKORG XL+ projects a style reminiscent of those well-loved vintage electric pianos. The design achieves that style which is both futuristic and retro. Small quality touches mean that when you play the microKORG XL+ you'll feel the difference. Metal levers, dials that move with audible clicks and sturdy operating knobs all enhance the feeling of quality. The new natural touch mini keyboard offers an improved playing feel than previous models. The proportion of the keys has been adjusted to allow for easier chord playing and the touch has been refined for greater ease when playing rapid phrases. The sophisticated waterfall-type keys are especially helpful when playing a glissando. The microKORG XL featured a sound selector that allowed you to choose your sounds using two large dials named "music genre" and "instrument category". The new microKORG XL+ keeps these dials but offers an additional selection of genres to fit today's modern, fast paced music scene. With more options you'll be able to find the program to match your song more easily than ever. The dials can also be used to make program changes during a song or to select vocoder variations. The microKORG XL+'s sound engine uses MMT (Multiple Modeling Technology) which provides two oscillators that generate hugely, powerful sounds. This lets you use techniques that cannot be imitated on typical PCM synths such as cross modulation, unison and VPM. Adding in modulation with oscillator 2 allows the creation of complex and powerful sounds. The microKORG XL+ boasts 17 powerful effect types including delay, echo, ring modulator and grain shifter. Effects such as delay can also be synchronised to MIDI clock creating a wide range of possibilities in live performances. 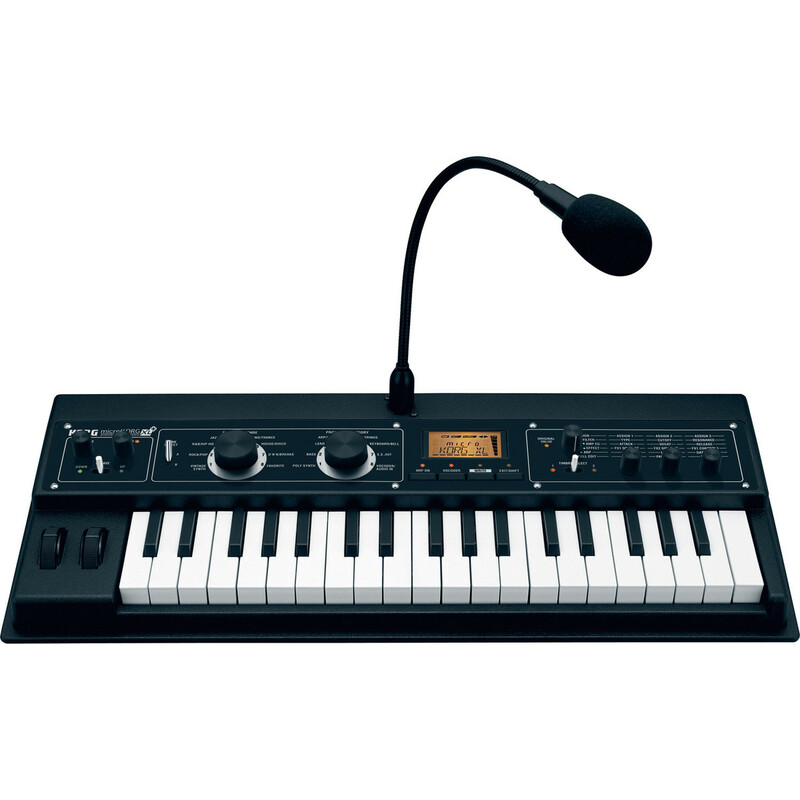 The micoKORG XL+ functions as a powerful vocoder that can provide hours of fun! Connect a mic and use its audio input to shape the tone of the oscillator's sound creating "talking" effects. The 16 band filter bank simulates vocoder sounds of the past and gives a wealth of experimental options. Using the vocoder sounds found in today's electronic music can be easily replicated. The gooseneck microphone is included with the keyboard so you can start experimenting straight away. When using the microKORG XL+ you can either take advantage of the included AC adaptor or run it on six AA alkaline batteries. At a mere 22inches long and 4.4lbs. in weight the keyboard is highly portable for performances on the go. Connecting the microKORG XL+ to your computer through USB allows you to use the sound editor software and edit all the parameters easily from your computer. You can download preset program data from the microKORG and the MS2000/MS200B free of charge to gain access to even more programs.